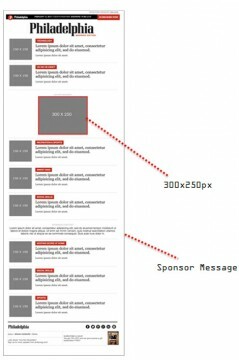 All e-newsletters feature a medium rectangle (300 x 250 px) sized ad unit along with a sposnor message (up to 25 words of text). See below for more details around each individual e-newsletter offered. Description: Wellness tips, workout trends, fitness headlines, healthy eating and more. Description: The biggest headlines and expert analyses by Sheil Kapadia & Tim McManus from Philadelphia’s most comprehensive and definitive Eagles blog. Description: The latest on the restaurant scene including trends in food & beverage, new restaurants, and exclusive promotions, discounts, and events. Description: Coverage of popular LGBT headlines on local and global topics, fashion, home, travel, events and more. Description: Wedding topics and trends including fashion, venues, inspirations, real weddings, engagement announcements and more. Description: Daily digest of local and national breaking news, controversial topics, gossip, politics and more from Philly’s most provocative voices. Description: Philadelphia’s newest real estate hub featuring properties for sale and rent, interior design and architecture, neighborhood news and new projects. Description: Deals, steals, and must-haves for every shopper. Fashion advice, news, and tips for great style and shopping around the region. Description: Philadelphia’s arts and entertainment scene including editor’s picks of the best shows, concerts, festivals, and beyond.